It is coming up on baking season and we want to get you all ready and in the mood. 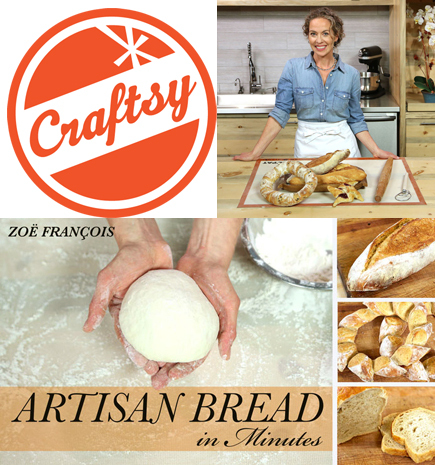 As you may have heard, we did a Craftsy video series that shows all the tips and techniques for creating our favorite breads. 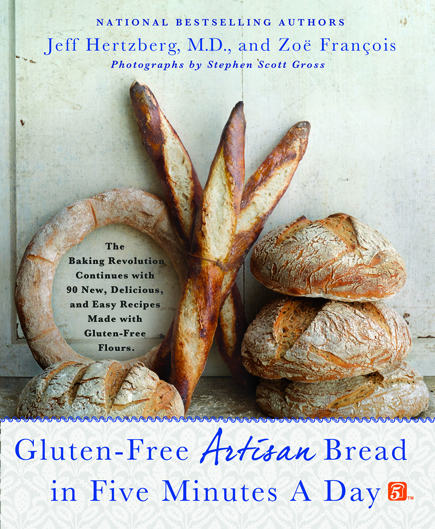 The class is based on our Master recipe from The New Artisan Bread in Five Minutes a Day, but the course is helpful for baking any breads and pizzas from all of our books. There are many ways to get a crusty loaf of bread, but one of our favorites is to use the tried and true method of baking in a clay cloche, here, the Emile Henry brand cloche. It is very similar to using a Dutch Oven, but the cloche was designed to bake bread, so it is an even more intuitive method. In other words, you aren’t lowering the bread into the piping hot vessel, you just lift the lid and slide the loaf onto what is essentially a baking stone. The cloche traps the steam from the dough to create a perfectly crisp and beautifully shiny crust, without having to add steam to the oven. This loaf was made with our Master Recipe from The New Artisan Bread in Five Minutes a Day, using Platinum Yeast from Red Star, water and salt, that’s it! If you’ve never made our bread, or just want a refresher, please watch our new video that we put together in the Gold Medal baking studio. 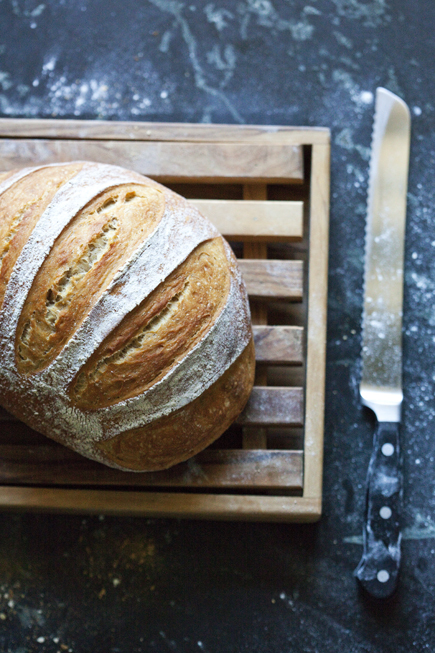 In no time at all you’ll have a gorgeous, homemade, crusty loaf of bread. Today our new book is finally available and we couldn’t be happier to welcome Artisan Pizza and Flatbread in Five Minutes a Day into our happy family. 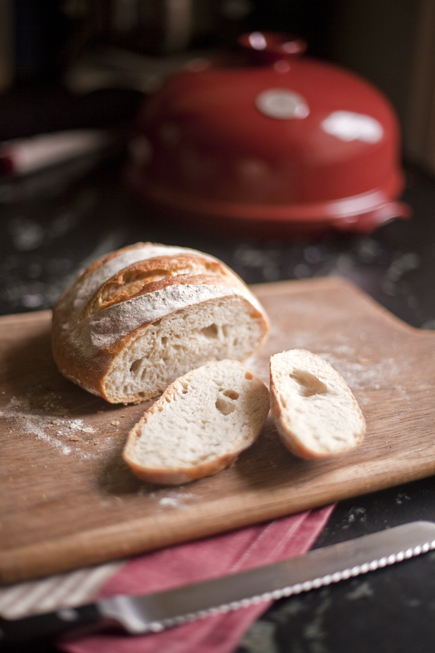 We are so excited for you to get baking from it, so we’re posting one of our favorite doughs from the book. I have to admit it took us a while to decide which one to share, since our favorite seems to change with our moods. This Olive Oil Dough is fantastic for a thin crust, a thick crust and so many of our worldly flatbreads. No matter the technique you decide to try, you’ll love the results. We like to make the classic Pizza Margherita, it’s the ultimate in Italian toppings. In fact, the colors resemble the Italian flag and the pizza was named for the Italian queen, Margherita, because she fell in love with it. Nothing but tomato, mozzarella, fresh basil and a drizzle of olive oil. So pure and so tasty.